A forever home. A family who loves you, a comfortable place to rest, plenty to eat and drink, a purpose in life, a sense of peace -- that is what every horse deserves. There is no place like home. Is your barn home for a Forever Morgan? To adopt, the first step is to fill out an adoption application and go through a reference check. Download the application, fill it in completely, sign/initial (we do need an actual signature, not a typed one), and send it to FM along with the $25 application fee. You can send it by email (scan and save it as a pdf), fax, or standard postal mail. If you're mailing the application, it's very helpful to also send an email to let us know. The application requires three non-familial personal references, vet, and farrier. Please tell your references to expect to hear from an FM volunteer and authorize your vet and farrier to talk to us. It makes the process much faster and easier! We understand if you don't have a current farrier if you haven't had horses lately, but we would like to talk to whoever you will use. Likewise, if you do not currently have an equine vet, we can talk to the vet you use for other animals or pets if you have any. When should I submit an application? If you are seriously considering adopting, we recommend that you submit an application even if you haven't decided on a horse yet. It can take up to two weeks to process the application and check references. Once you're approved as an adopter, you'll be ready when the right horse does come along, whether it's a horse that is currently available or a new one that comes in. What if several applicants want the same horse? This is a good problem to have, but it’s still a problem! The FM Board has to choose the home that is best for the horse. The submitted applications are considered first for their ability to adopt from FM, and then to select the best home. They look at each application and may ask the applicants for additional information about why they want to adopt this specific horse. These decisions are difficult because no matter what happens, someone will be let down. The applicants who are not chosen are understandably disappointed, but frequently “their” horse comes along soon afterwards. 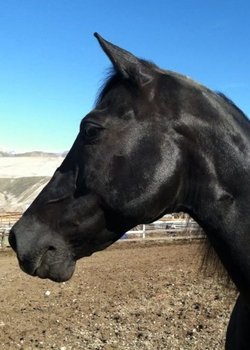 With some patience and understanding, even more horses can find forever homes. Horses can NOT be reserved, and it's not first-come-first-served. Anyone who has the desire and ability to care for a horse can adopt. The adoption application includes questions about your experience and how the horse will be housed and cared for. Your references should be able to describe your ability, knowledge and care. While we believe that every horse needs a job, we will not adopt out any of our horses where they are used as sole means of transportation. What are the adopter’s responsibilities? The adopter's first responsibility is to take this seriously, knowing that while Forever Morgans is there as a safety net in case of serious life events (serious illness, death, bankruptcy, things of that nature), you have made a lifelong commitment to the horse. These horses have already been let down by humans in the past; you are promising to be the person that shows them that not all humans consider them disposable. Please remember that sometimes it can take a few months, sometimes even up to a year, for a rescued horse to learn to trust again and show you who they really are as a result of the treatment they received by those people who considered them “temporary.” Your job is to be there for the long haul so they can be who they were meant to be. Do I own the horse I adopt? Yes! The adopter becomes the legal owner of the horse once the adoption contract is signed by all parties (the adopter and an FM representative). Any registration or transfer papers for the horse will be sent to the adopter as soon as possible. If the horse is registered, the adopter should submit an ownership transfer with AMHA as soon as possible. Any horse adopted through Forever Morgans does have a lifetime contract with two restrictions: breeding is only allowed on a limited basis with prior approval, and FM must approve any new owner if the horse is sold, given, rehomed or otherwise transferred. This is for the protection of the horse and any of its offspring. Here's a copy of the contract if you would like to review it. Each horse's adoption fee is set according to factors such as the original cost of rescuing the horse, its age, registration, and level of training. Having a reasonable adoption fee gives value and worth to the horse, makes the adopter more likely to take the adoption seriously, and helps FM to save other horses. Through bitter experience, FM has learned that giving the horse away puts the horse at risk by not putting a value to it. Adoption fees also help recoup some of the expenses incurred in rescuing the horse, such as the purchase price (if the horse is from an auction, broker, or private seller), vet, quarantine and board, transportation to and from quarantine, and other expenses. What happens when the adoption is approved? The full adoption fee is due when you are notified that the adoption has been approved. As soon as the horse's adoption fee is received, FM will tell the foster home (or boarding barn, if the horse is in QT or boarded) that the horse can be released to the adopter. The adopter is responsible for the horse's expenses (board, veterinary bills, transport, etc.) from when the adoption is approved and the adoption fee is paid. If the horse needs to stay at its current location until transport is arranged, the adopter is responsible for making these arrangements. How do I bring the horse home? The adopter is responsible for transporting the horse from its current location, whether that is a quarantine facility or a foster home. FM works with several transportation companies who offer reduced rates for rescues. The adopter is responsible for getting any necessary paperwork, such as a Health Certificate or Coggins test, for the horse to travel. FM will provide copies of any paperwork that has already been done for the horse, such as a Coggins test. If I adopt a mare or stallion, can I breed? Mares and stallions adopted through Forever Morgans are not adopted to be broodstock. FM does allow breeding on an extremely limited basis and only with prior approval from the FM Board. The adopter should intend to keep the resulting foal for life and the foal will have an FM contract. Speculative breeding (with the intention of selling the foal) is not allowed. Finally, it is agreed that the horse is NOT to be bred without prior approval by Forever Morgans, and any purchaser of a foal resulting from an approved breeding will complete a copy of the Application and Agreement and shall be bound by the terms thereof. Furthermore, if an adopted mare is discovered after adoption to have already been in foal when adopted, said foal is subject to the same conditions as the dam. What happens if I adopt and my situation changes? FM is committed to the horses we rescue for the rest of their lives. The adoption contract spells out the responsibilities for the adopter and FM. Horses are adopted with the hope and assumption that the adoption will be permanent, but we recognize that life changes sometimes mean that the adopter can no longer keep the horse. If this occurs, the adopter should contact FM as soon as possible so that we can help find a new home for the horse. The adoption contract includes a "right of first refusal" and FM can take possession of the horse if needed, but we will gladly work with the adopter if someone is interested in adopting the horse and is a suitable home. Any potential adopter does have to complete an adoption application with reference checks and must be approved by FM prior to taking custody of the horse. Can I sell my adopted horse? FM does not adopt horses with the intention of them being resold. If it would be in the horse's best interest to be with a new owner -- such as the horse has bonded with another person, or the adopter cannot meet the horse's special needs or abilities -- the adopter should contact FM as soon as possible to discuss the situation. The potential new owner must complete an adoption application and be approved by FM. The horse may not, under any circumstances, be sold at any type of auction horse broker, feed lot or slaughter destination.